In 1858, four million enslaved black people wielding political power in the American South would have seemed impossible. Ten years later, it became a reality. Thomas Nast, “The Emancipation of the Negroes, January, 1863 – The Past and The Future,” Harper’s Weekly, January 24, 1863. From the urban rebellions to the salute at the Olympics, commemorations of 1968 — a pivotal year of Black Power — have appeared in news headlines throughout this anniversary year. Yet 2018 also marks the 150th anniversary of 1868 — the height of Black Power during Reconstruction. It’s not surprising this anniversary has been ignored. Reconstruction is given short shrift in classrooms across the country and history textbooks tend to focus their narrative on the battles between the president and Congress. The year 1868 comes up in textbooks as significant only because of the election of Ulysses S. Grant. This focus on those at the top misses the groundswell of activity that made the year so explosive. We lost one of the few historians who wrote about the importance of 1868 earlier this year. Lerone Bennett Jr, historian, journalist, and editor at Ebony magazine for decades, died this February at the age of eighty-nine. His book on Reconstruction, Black Power U.S.A., remains one of the most powerful and engaging texts on the era. In the North, in this year, there was wild talk of using troops to forcibly dissolve Congress and arrest its leaders; and in the South thousands on thousands of angry Black people thronged the dusty roads, shouting defiance and demanding a division of the loaves and fishes. This was the year of the Fourteenth Amendment; this was the year men made the Declaration of Independence walk in the streets; this was the year almost all things were made new …. During the whole of this pivotal year, the South vibrated with the impassioned sounds of extraordinary assemblages of Blacks, native whites, and Northern newcomers. It was in 1868, in state after state, when Black men, many of them formerly enslaved, gathered with white men, many of them poor and disempowered until Reconstruction, to rewrite the constitutions of the South. In the early years following the Civil War, however, far from having the power to reshape the basic law of the land, for many Blacks it seemed as if freedom would not be that different from slavery. After Lincoln’s assassination, President Johnson pardoned former slaveowners, returning land to them that had been confiscated and given to freedpeople, and laid out extremely lenient requirements for Southern states to rejoin the union. Johnson’s actions gave a green light to white planters who led violent campaigns to intimidate freedpeople back into submission. Southern states passed new laws known as Black Codes, aimed at imposing slavery by another name. For example, Mississippi demanded that freedpeople carry proof they had entered into a labor contract or they could be imprisoned. The law also forbade African Americans from renting or leasing land. In South Carolina, Blacks unwilling to be farm workers had to get special permission from a court. 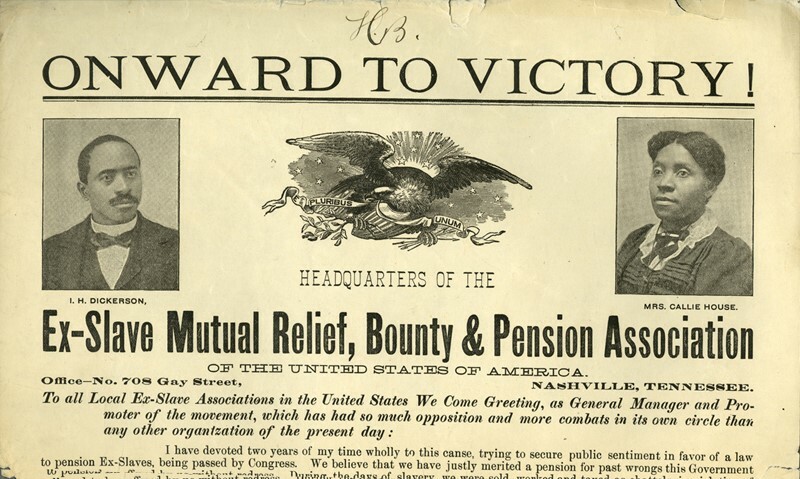 Isaiah Dickerson and Callie House advocated for a national pension fund for formerly enslaved people for their years of unpaid labor. But throughout the South, Black people refused to go back. They organized into Union Leagues, defending each other from white attacks and organizing boycotts and strikes to prevent plantation owners from imposing slavery-like conditions. They organized Black political conventions across the South to demand the right to vote, schools, fair wages, and land. They marched, protested, and flooded Congress with petitions and resolutions. Their efforts were successful. When Congress convened in 1866, they refused to seat the delegates — many of them former Confederates — from Johnson’s state governments. Instead, they came up with their own Reconstruction plan requiring states to hold new conventions to rewrite state constitutions and adopt the Fourteenth Amendment declaring Black people citizens whose rights could not be violated by laws like the Black Codes. By the time the new voter registration process was completed, Blacks were a majority of the registered voters in Mississippi, Alabama, Florida, Louisiana, and Georgia. In South Carolina, there were nearly two Blacks registered for every white person. In every other Southern state, they held sizable and influential minorities. 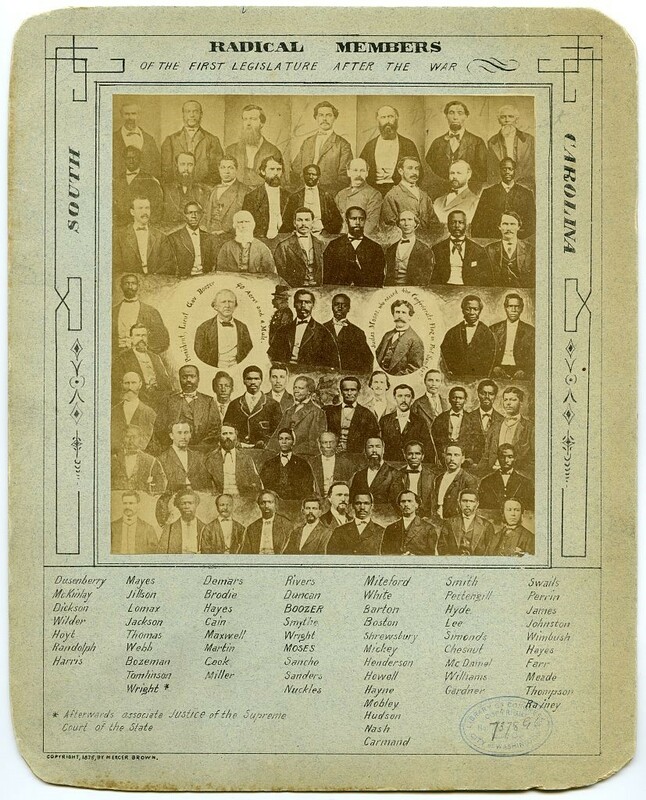 Starting in Alabama in November of 1867 and ending with Texas that opened its convention in June of 1868, multiracial assemblies met in Southern state capitol buildings — most built by the labor of the enslaved — to radically alter the political and economic landscape. Here were no middle-class lawyers and businessmen speaking for the people. Here, for the first and last time in America, was an assemblage of people, many of them poor, speaking for themselves …. Although experienced men, some of them lawyers and former legislators, moved to the fore in many places, there was, in every state convention, an articulate core of common people who spoke with uncommon authority, not because they had conferred with the people, but because they were the people. In the name of the people these delegates fought to make Southern constitutions reflect social and economic justice. The Mississippi state convention passed a tax for the relief of needy freedmen and a resolution that would have returned property taken from freedmen if it hadn’t been vetoed by the general controlling the state. In Alabama, a resolution passed that allowed freedmen to collect $10 a month in back pay from former masters for any work completed after January 1, 1863, when the Emancipation Proclamation took effect. Radical members of the first South Carolina legislature after the war. In South Carolina, the only state where Blacks made up a majority of the delegates, the convention passed a resolution asking Congress to lend the state $1 million to buy land for poor whites and Blacks. When Congress rejected the proposal, the first South Carolina legislature under the new constitution passed a homestead law to aid poor farmers and shifted the tax burden to large plantation owners. At a time when even most Northern states restricted the franchise to white men, every convention extended suffrage to Black men and a few delegates, like W. J. Whipper in South Carolina and Thomas Bayne in Virginia, pushed to extend the franchise to women as well. Several conventions expanded women’s property rights and in South Carolina, legalized divorce. Also unlike the Northern constitutions, the South’s new laws protected Black civil rights. Blacks could now hold office, serve on juries, and several constitutions explicitly banned the kind of discrimination that would later characterize the Jim Crow South. Yet none of these accomplishments is highlighted in today’s corporate textbooks. Glencoe’s American Journey, offers one line summing up these revolutionary conventions: “By 1868, seven Southern states — Alabama, Arkansas, Florida, Georgia, Louisiana, North Carolina and South Carolina — had established new governments and met the requirements for readmission.” Even this is more than most textbooks allot. The texts that I’ve reviewed mention African Americans as beneficiaries of Congress’s benevolent policies, not as actors in securing their own liberation. The history of this transformative year is worth resurrecting. Like in 1968, the achievements of the Black freedom struggle, inspired others to fight against their own oppression. 1868 was also the year that organizing pressured Congress to enact an eight-hour work day for federal employees. William Sylvis, who argued that Black and women workers should be welcomed into the white male labor movement, was elected president of the National Labor Union — the first national labor federation. Augusta Lewis formed the first female union, the Women’s Typographical Union in New York City, and made common cause with suffragists. Women’s rights advocates and abolitionists still worked together for universal suffrage in the American Equal Rights Association. Clockwise: Frances Harper, W.J. Whipper, Augusta Lewis, and William Sylvis are a few of the people featured in the role play. The explosion of grassroots activism during 1868 offers us the opportunity to bring this democratic ferment into classrooms and activist meetings. 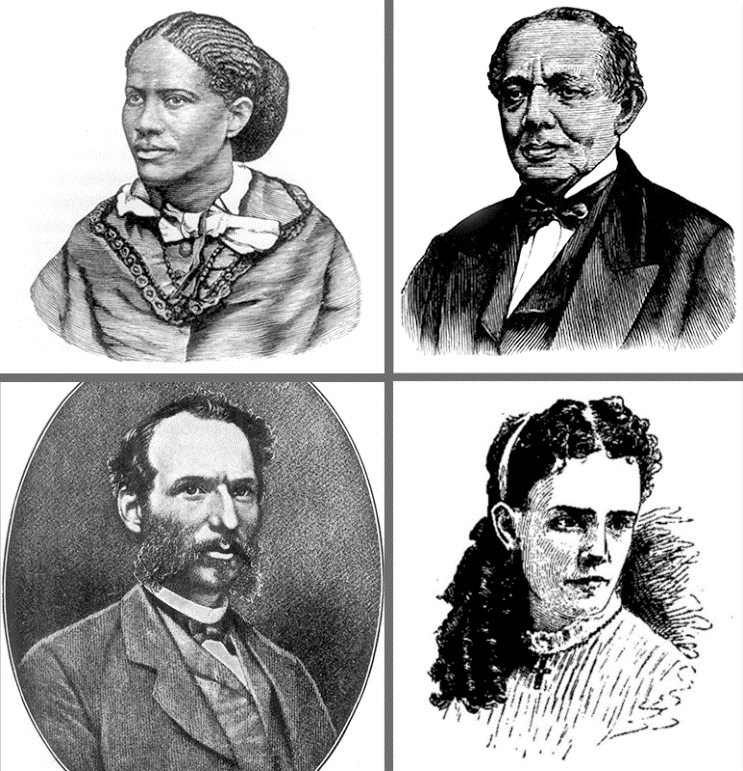 In a role-play activity I wrote with the Zinn Education Project’s Nqobile Mthethwa, participants take on the roles of Sylvis, Lewis, and others who fought for women’s and workers’ rights, as well as P. B. S. Pinchback, W. J. Whipper, and other key players in the 1868 conventions. As participants “meet” these individuals, they learn about the revolutionary possibility of solidarity. They also learn how racism, sexism, and classism can divide movements with devastating consequences. The dissolution of these alliances helped pave the path for Reconstruction’s end. Yet in 1868, what had seemed impossible only a decade before — four million enslaved people wielding political power in the South — became a reality. Black Southerners led a political revolution that for a short time advanced the interests of all poor and working-class people. The implications of this achievement are hard to grasp. In today’s deeply unequal society the typical US Congress member — a majority of whom are millionaires — is at least twelve times richer than the ordinary US citizen. How might society change if teachers, nurses, waiters, transportation and construction workers, and other working-class people rewrote the laws of the land? Recalling a time when the empowerment of the most oppressed in our society paved the way for other social struggles also gives weight to today’s slogan that all lives will matter only when Black lives matter. 1868 is a year we should remember and learn from. Adam Sanchez ([email protected]) teaches at Harvest Collegiate High School in New York City. He is an editor of Rethinking Schools magazine and a Zinn Education Project teacher leader with a focus on the Teach Reconstruction campaign.